This project is an interactive tour of 1982 Asia and Europe. It includes images of Hong Kong, Japan, a vintage 1920's Russian steamer crossing the Japan Sea, a ride on the Trans-Siberian train across the then Communist country of the Soviet Union, the Scandinavian countryside and the capitals of Northern Europe. In addition it includes excerpts from the photographers' journal entries as they explore the world and learn about the ups and downs of taking a four month journey. 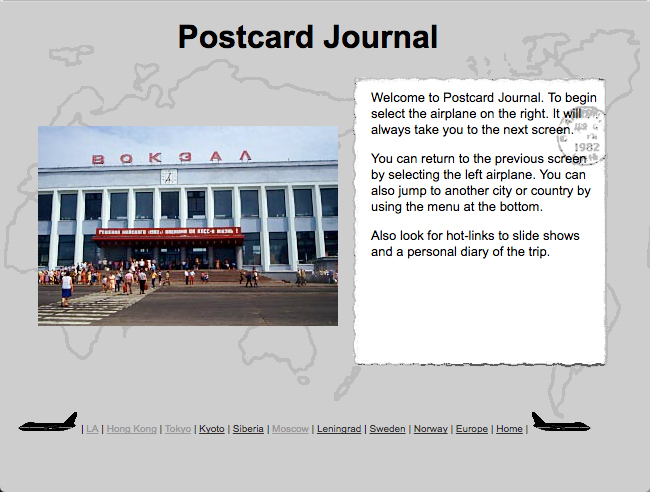 Postcard Journal contains over 100 photographs taken by Ann-Marie Rose and David Husom. Originally exhibited at the Walker Art Center in Minneapolis and Film in the Cities in St. Paul Minnesota as multimedia slide shows it was recreated in 1996 with Macromedia Director as a Macintosh based CD-ROM. It was recreated again in 1999 for the web. It is offered here in its original web form with vintage HTML. Sorry it may not display perfectly in some mobile devices. (Select the image to the right or below to open the project).